It give's me great pleasure to officially announce, Rogue has been working on his first solo scratch build mod. It's a one car mod of a 2010 GT500 Mustang. 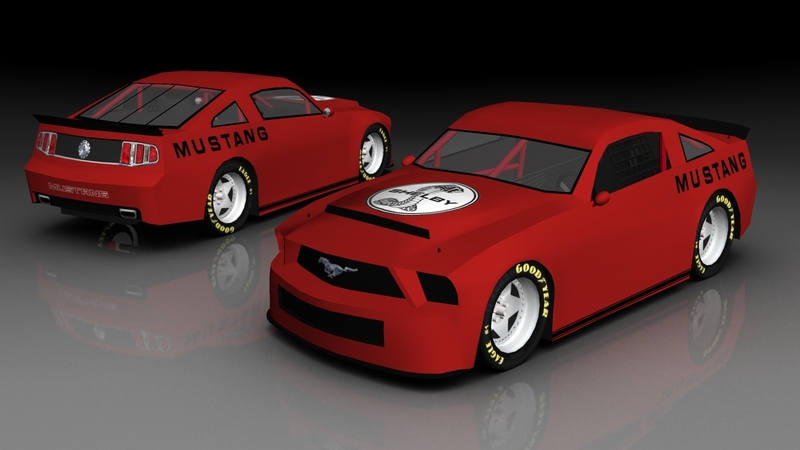 It will be decked out in racing trim, to replicate the IROC racing series. Another pic showing the w.i.p interior. What game nr2003 or nascar heat or any other game? It is for Heat at this stage, may use in other sims if interest is good. Thanks, working on the final processes now before testing later. Been a while since w.i.p pics. I'm a GM person myself but I would prefer any newer model IROC mod. I only use NR2003 though. I miss seeing IROC, those multi-colored cars were so cool (before the Crown Royal sponsorship days) and would like to do a fictional series as if they still existed. Thanks, This car went into a mod, after it started as a modeling tutorial. The tutorial only covered 1 front fender, The rest I did following a blueprint the best I could. Aside from the whelen modifieds, This is my FIRST factory style car model, which I am quite proud of. Being my first model, a lot of hours went into it. Too many to remember now. Paint design in game testing. Cannot wait to broadcast this, Also tell everybody about your work. This is stunning and looks amazing, Your hard work deserves all the credit.